5697 NETPL513.jpg 500X638\NETPL513.jpg Send A Hint! Product Description: less text Saying Congratulations just got a lot more exciting! This white gift basket with an areca bamboo, a bouquet of roses and crysantunums, a Congrats balloon, a cute and fluffy teddy, Fererro Rocher chocolates and a bottle of non-alcoholic J.C. Le Roux bubbly is the perfect way to celebrate special achievements! 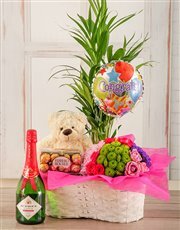 Send this plant basket with NetFlorist today and let the celebrations begin! 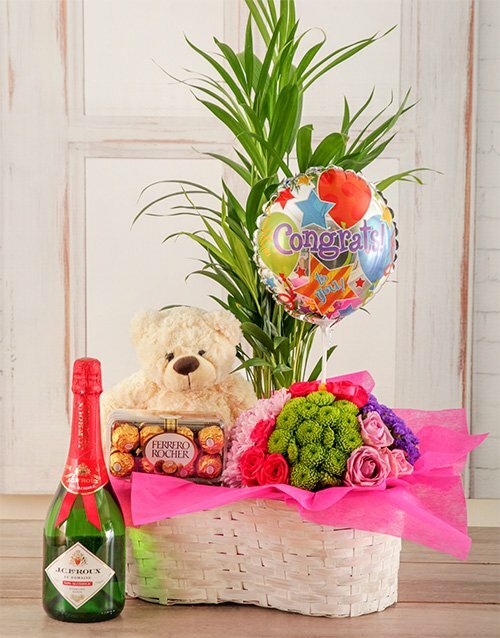 Get this Congratulations Bubbly Plant Basket delivered with NetFlorist.